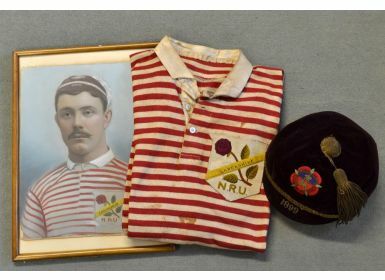 1899 Lancashire County Northern Union Jersey, Honours Cap and portrait: Formerly the property of H Kruger (Rochdale Hornets) who features in the large coloured framed glazed 14” x 10.5” picture wearing the same. Jersey a little grubby and with suitable stains, but bright with those narrow scarlet and white Lancashire hoops, collar apparently starched (later?!!) and 2 of 3 buttons present. Maker’s name and attractive Lancs badge. Maroon revised style County Cap, maroon with god braid and tassel tarnished but in good outside condition, much-frayed to the inside though. HK monogram to inner and makers’ name, Joe Nicholls (Yorks and England Cricket) & J T Brown, Halifax. Henry Kruger was born in 1878 in Manchester but of Welsh parentage. His parents returned to Cardiff. He played rugby as half back for Llwynypia and then “went north” and played for Rochdale Hornets and Hull Kingston Rovers. 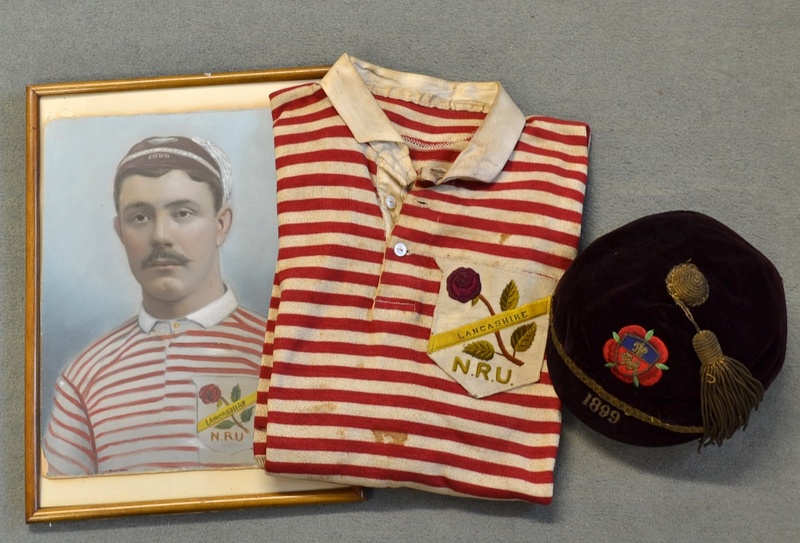 The medal, jersey and cap were won for Lancashire in the 16-13 win over Yorkshire in 1899, part of the Rugby League “War of the Roses”. All good condition for age and a very atmospheric and attractive trio of items.